Happy New Year! Time to celebrate with some fancy soup! Although this may look super fancy, this is hands down the most flavorful and easiest soup I have ever made. And by the end of this post, I am going to convince you of that. It is creamy, spicy and slightly sweet and you even get to top it with a little toasted coconut. Fancy. 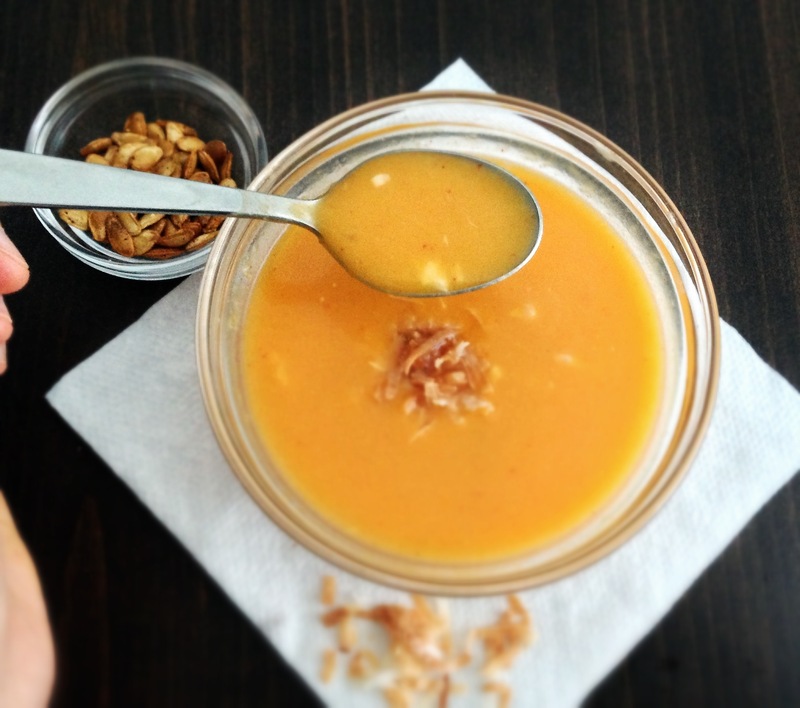 If you love Thai flavors, you will LOVE this soup. 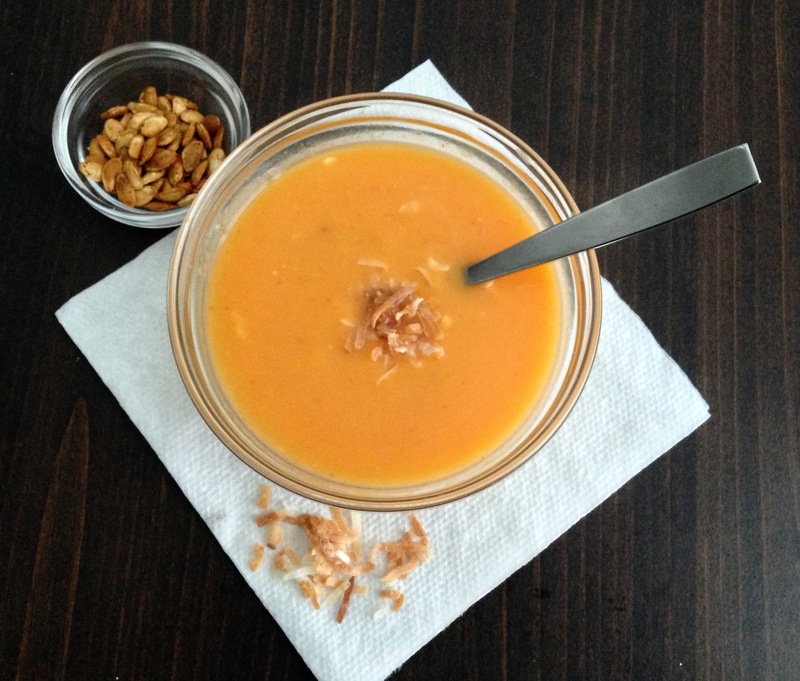 Coconut milk makes the soup creamy, butternut squash makes it healthy to eat all that coconut milk AND red Thai curry paste makes it spicy! Add a little apple for some sweetness and you have THE BEST SOUP. I even made it as a Christmas present for my Aunts upon request! I know there are tons of butternut squash soup recipes out there. So, you’re probably wondering: “what makes this soup so damn special?” Well, my recipe calls for ingredients that most people usually have. It only requires 1 fancy-ish ingredient – Red Thai Curry paste – and this can be kept in your fridge for a long time. So you buy it once and can use it throughout the year. The only additional fresh ingredients (besides the squash) you need you probably already have in your kitchen: onion, garlic and apple. 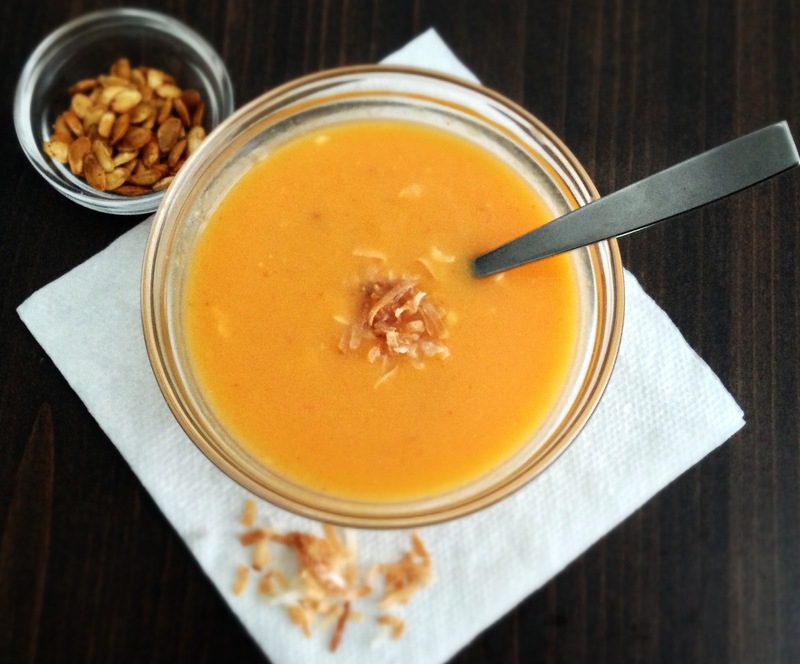 Everything else keeps, so you can make this soup whenever you buy a butternut squash! 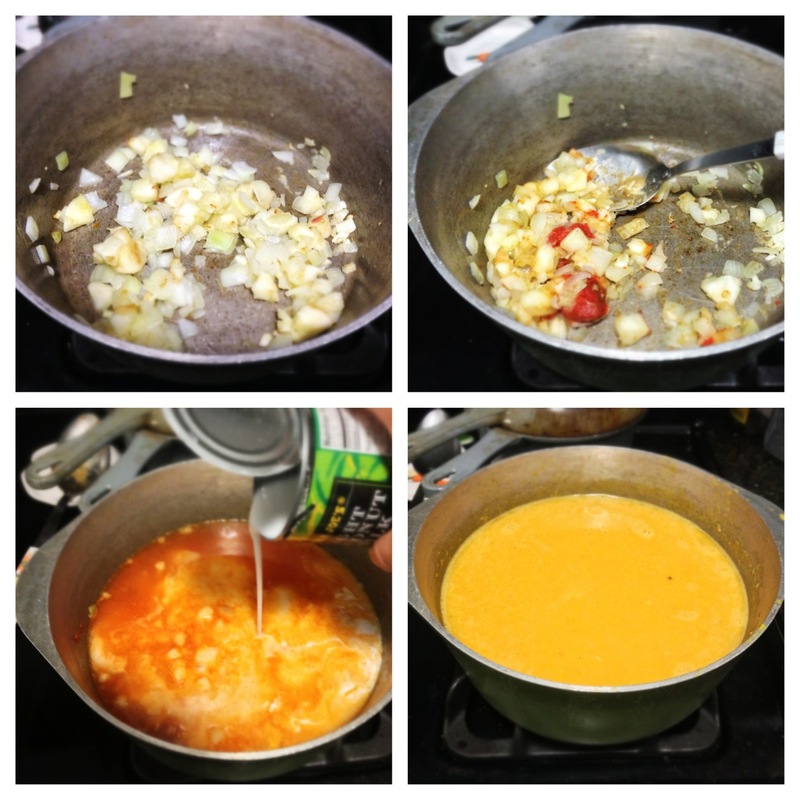 What is the secret to the super flavor in this easy soup? Freshly roasted butternut squash! 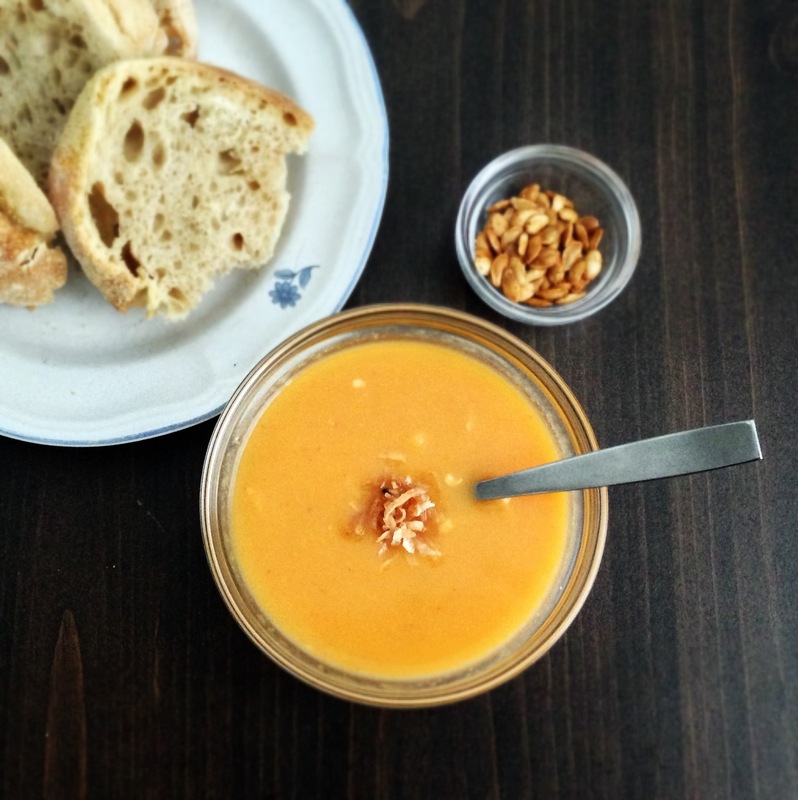 Before I started making this soup last year, I was TERRIFIED of roasting my own squash. Those big, hunky vegetables look so intimidating in the grocery store, don’t they? FEAR NOT my friend. I am here to tell you – YOU CAN DO IT! And I’m showing you exactly how. 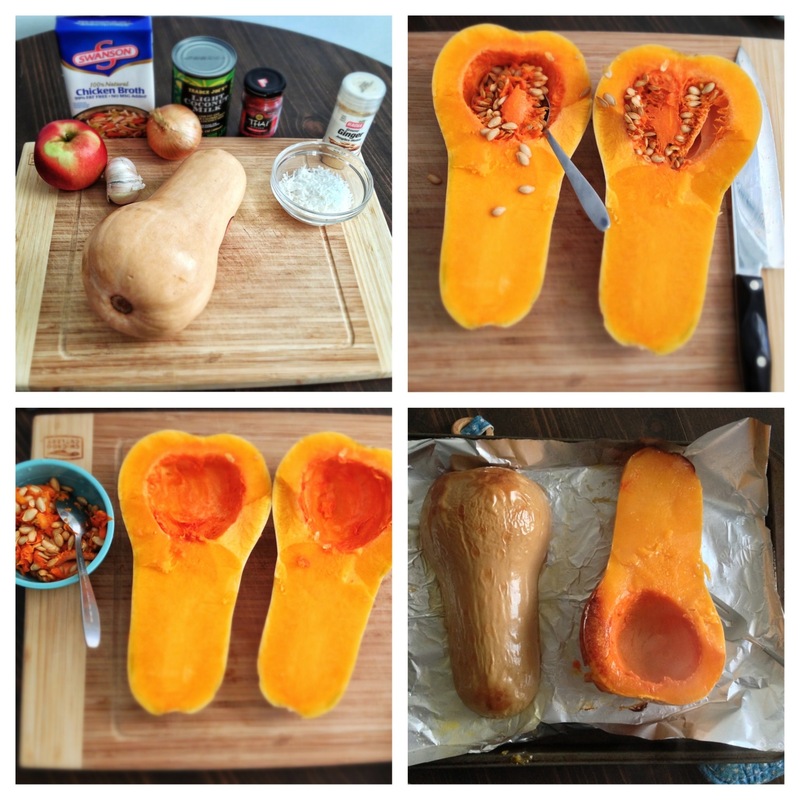 Steps for roasting your butternut squash. 1. Slice open. 2. scoop out seeds 3.Brush oil and place cut side down on baking sheet lined with aluminum foil (for easy cleanup). The 4th photo is what the squash looks like when it is done roasting! Slice the butternut squash in half, lengthwise on a cutting board (carefully!). I usually start to cut at the fat end, since it is easier to cut through the part where the seeds are. Once halved, scoop out the seeds and save them for later! (You can roast the seeds and salt them -they are delicious!) After your squash is cleaned out, brush a tablespoon of oil (canola, olive, or vegetable – whatever) on the flesh of each half and place flesh side down on an aluminum foil lined baking sheet (for easy cleanup!). Bake at 400 degrees F for about 45 minutes. There. Done. That’s roasting your own squash. Easy, right? You can do this days in advance and then making the soup will only take 20 minutes! If you are roasting the squash and making the soup the same day, then while the squash is roasting, get started on the rest of the soup. Add some oil, garlic, onion and peeled and chopped apple to the pot. Saute for a few minutes then add the ginger and the red curry paste. Saute for a few minutes Then add the liquids and the roasted squash – simmer for at least 10 minutes, puree with an immersion blender or blend in batches and done! YUM! Sweet, Savory, Coconut-y goodness! Warms you and fills you up! Go make some right now!!! Roast the Butternut Squash (This can be done days in advance) Preheat oven to 400 degrees F. Halve squash lengthwise and scrape out all the seeds and stringy stuff (Save seeds for roasting later). Line a baking sheet with aluminum foil, brush the cut flesh with about 1 tablespoon of oil, and place flesh side down on foil. Roast squash until it is very soft – depending on the size about 45 minutes to an hour. Allow Squash to cool for about 10 minutes and then scoop flesh out of the peel into a bowl. Use immediately in soup, or place into a sealed container and refrigerate for about a week or freeze up to 2 months. Make the Soup. (While the squash is roasting-if doing this in one day) In a large pot, add the remaining tablespoon of oil, onion, garlic and peeled apple and sauté on medium heat for about 3 minutes, or until onions are soft. Add Thai red curry paste and ginger and stir briskly for about 30 seconds. Next add the broth, coconut milk and the roasted squash and simmer for at least 10 minutes. If I have the time I like to simmer for 30 minutes and even more if I get busy and forget about it. 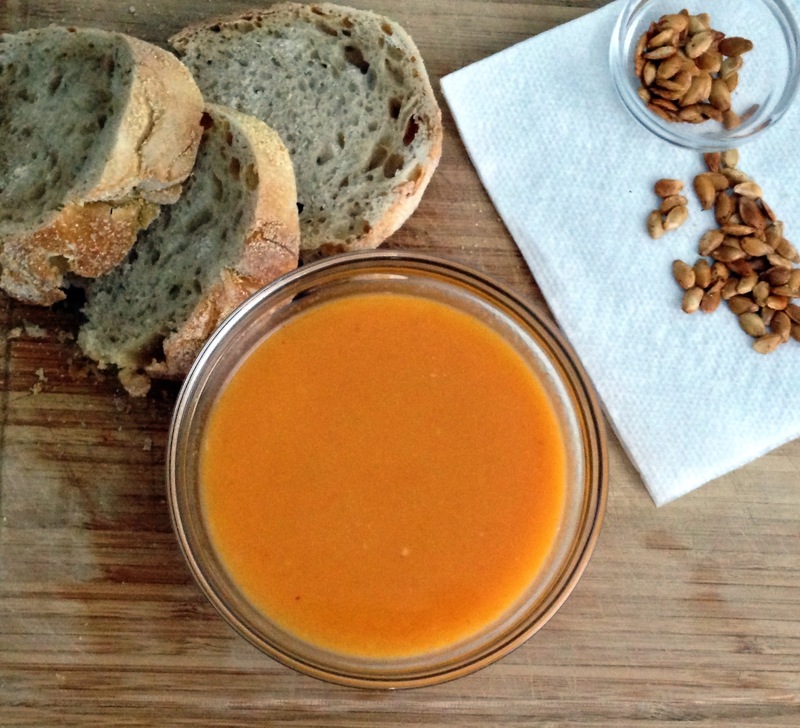 Purée soup with an immersion blender (or in batches in a blender or food processor) – and serve! For serving: Optional (but highly recommended) — Top soup with toasted sweetened shredded coconut (toast shredded coconut on a baking sheet in oven at 400F for 2 minutes (be sure to watch so it doesn’t burn!) Or toast the shredded coconut it in your microwave! 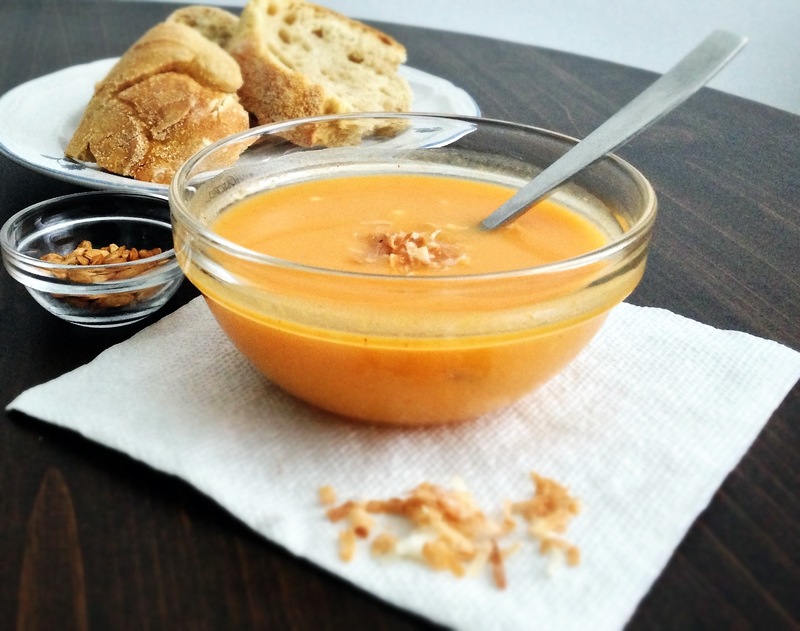 This soup makes great leftovers! It tastes even better the next day. Keep leftover soup in a sealed container in the fridge for a week(ish). Seriously, go make some right now! !